Image made using an E-PM2 with Olympus m4/3 14-42mm II R, using grainy black and white art filter in camera. I think it needs a bit more by the way of explanation, because although it looks interesting, I'm not sure what I'm looking at. Unique composition. Not sure the razor-thin plane of focus works for me here. I'd like to see more detail deeper into the shot. And maybe back off the blacks a tad to show at least a hint of detail in the dark abyss. It's the wall of a greasy spoon chili joint that's been there for about 100 years. 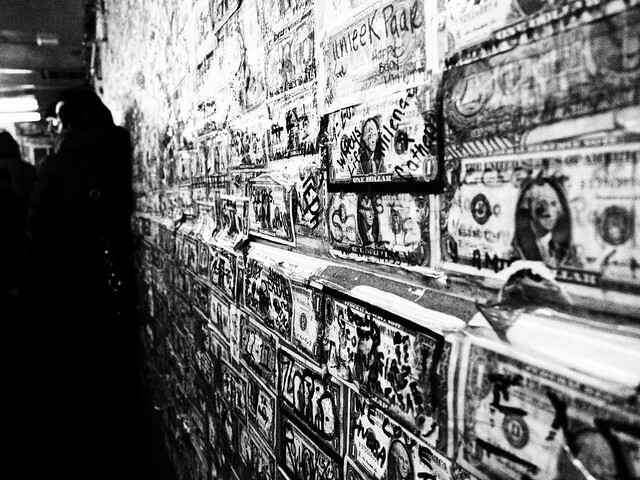 The wall is plastered with $1 bills put up for "good luck". Thanks for the comments. I'll play around with it and see if I can get more details out of the dark shadows.